reposted from the Armagh Observatory here. When the sun began to rise on the morning of 13 August 1930 like any other morning, little did the inhabitants along the banks of the River Curuçá in the Brazilian Amazonas region, near the Peruvian frontier, realise what was about to happen. The women of the community had started washing clothing and the fishermen and rubber-tappers had begun their days work. Suddenly, at about eight o’clock, the sun became blood-red and a darkness fell over the region. A large cloud of red dust filled the air, and then a fine white ash descended to cover the trees and plants. There then followed ear-piercing whistling sounds, three in total, after which three mighty explosions were heard in rapid succession. Immediately after the explosions, the whole forest became a blazing inferno which lasted for several months, depopulating a large area. These terrifying events caused the inhabitants to believe they were about to face death. Five days later, Father Fedele d’Alviano, an Italian Capuchin-Franciscan monk, began his annual missionary visit to the River Curuçá area. He came upon the people still in a highly agitated state, demanding of him an explanation of what had happened. Trying to reassure them, Fedele said that this was not the wrath of God coming upon them, but, instead, the fall of a number of meteorites. Fedele interviewed many hundreds of eye-witnesses of the event and sent his report to the Informazioni Fides: L’Osservatore Romano, the Vatican newspaper (1931). A report of the event was also published in the Daily Herald newspaper (1931). In the Journal of the International Meteor Organization, Vasilyev and Andreev (1989) make mention of this event as a possible ‘Brazilian twin’ of 1908 Tunguska event. In their note, Vasilyev and Andreev refer to a paper by Kulik (1931), which contains information that was published in the Daily Herald. Bailey et al. (1995) provide a summary of the Daily Herald article and a complete translation of the L’Osservatore Romano article. In his article, Fedele states that he visited many sites along the River Curuçá listening to what the inhabitants had to say. He heard how that, as the whistling noises increased in intensity – like those of artillery shells, the children ran to hide in the corners of their huts. Some of the fishermen, however, gazed upwards and witnessed large balls of fire falling from the sky. The three explosions caused tremors like those of an earthquake and were heard over distances of several hundreds of kilometres. The Sun remained obscured by the rain of ash until midday. The Daily Herald article refers to Fedele’s report and also mentions that, when the ‘meteors’ struck the ground, ‘the whole forest was ablaze.’ The fire is reported to have lasted for some months, and depopulated a large region of the forest. Bailey et al. make several comments on the L’Osservatore Romano report, concluding that a fall apparently took place near latitude 5° S and longitude 71.5° W. Bailey et al. point out that the date of 13 August coincides with the peak of the annual Perseid meteor shower. Since no direction of travel, nor precise time of passage, of the fireballs is given, the link with the Perseids cannot be confirmed. The appearance of the dust before the passage of the fireballs is somewhat of a mystery. Huyghe (1996) gives an excellent account of the events surrounding the affair. Bailey et al. called for a search of meteorological and seismological records covering the days and weeks following the 13 August 1930. Lawrence Drake (1995), Director of the San Calixto Observatory in La Paz, Bolivia, in a letter to Mark Bailey, included the seismological record from La Paz for 13 August 1930. The San Calixto Observatory, in operation since 1913, was one of the few places in the region which operated a seismograph (de la Reza 2000a). In fact, one of the best seismological registers of the day, using Galitzin photographic paper, had been put into operation there in 1930 in time for the August event. On this record, three events occurred, the first at 12:04:27, the second at 12:04:51, and the third at 12:04:56 UT. These times correspond to a few minutes after 8 o’clock in the morning local time in the River Curuçá area. At the time, the events were, however, assumed to have been earthquakes at a distance of 210 km, which placed the location in Bolivia, or possibly Peru, rather than in Brazil. In the meantime, Ramiro de la Reza, an astrophysicist at the National Observatory in Rio de Janeiro, noticed Bailey et al.’s paper and took up the challenge. He organized a search for signs of an impact near the location given by Bailey et al. On infrared images taken by the LANDSAT satellite and from aeroplane radar maps, de la Reza identified one major feature to the south-east of the town of Argemiro, near the River Curuçá, which might be an impact signature. The feature corresponds to an astrobleme about 1 km in diameter. 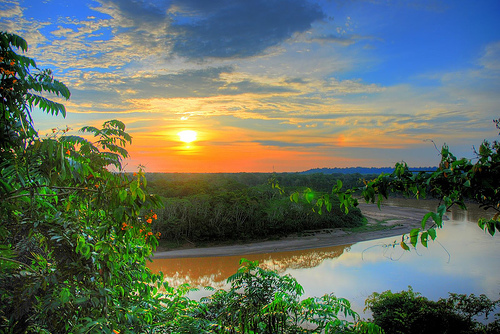 De la Reza led an expedition into the dense jungle along the banks of the Curuçá to try to find evidence of an impact. The party included the meteorite hunter Wilton de Carvalho and geologists Paolo Martini and Arno Brichta. The expedition, also organized and financed by Globo Television in Brazil, set out in June 1997 near the end of the rainy season and was filmed by Richard Smith for the Quantum programme of the ABC-TV, Australia (de la Reza 1998), which also provided partial funding. Some “stones”, i.e. compacted clay, were found in part of the perimeter wall and in the central structure at the location of the suspected crater. However, no trace of crystallisation by impact was found in these stones, indicating that they were probably formed by the upheaval of internal pressure-compacted layers. One very interesting outcome of the expedition, was that de la Reza was able to contact a possible eye-witness of the August 1930 event who stated that only one bolide was observed travelling from the north. This direction matches very nicely the direction in which a Perseid meteor, originating from periodic comet Swift-Tuttle, would have intercepted the Earth at 8:00am. However, one has to be cautious about how much reliance can be placed on such a statement after the lapse of almost seventy years. Regarding the detection of any iridium resulting from the impact, de la Reza (2000b) believes that much more material would have to be analysed in order to draw any firm conclusions. Also, it is uncertain how much iridium is contained in hydrometeorites. Roberto Gorelli, an Italian astronomer, has collected much information about this event, and has estimated that the mass of the meteorite was between 1000 and 25000 tons, with an energy of 100 Ktons, making it the second largest meteoritical event in the twentieth century after Tunguska (Gorelli 1995). Gorelli estimated a height of disintegration of from 5 to 10 km for the body(ies). Angela Vega, a seismologist at the San Calixto Observatory, at the instigation of Ramiro de la Reza, carried out an in-depth study of the La Paz record, and concluded that the signals could be the result, not of an earthquake, but of surface waves of type Lg, that is, Love waves crossing granite, indicative of a surface explosion or meteorite impact (Vega 1996). Vega’s reasons for the possible acceptance of the record as a meteorite impact are: 1) the good transmission of the seismic Lg waves, and 2) the low energy present in the spectrum of amplitudes for periods less than 3.0 sec. Vega points out that, assuming an impact in the River Curuçá area, 1300 km from La Paz, the waves would have been less damped in their journey to Bolivia because they travelled mostly parallel to the Andes mountain range. The seismological station in Peru did not come into commission until 1932, and for the station in Quito, Equador, the waves would have had to cross the Andes in a transverse direction and so suffer much damping. De la Reza (2000a) further points out that the magnitudes of the events as recorded are consistent with those expected from the conversion of the kinetic energy of meteorites into seismological energy. However, Vega could not state categorically that the waves were generated by a meteorite impact, only that it was one possibility. The seismological record does, though, preclude an event produced close to the La Paz station, and Vega’s analysis of the record is consistent also with only one surface event, or impact, signature. Vega’s paper is in Spanish, and the author is indebted to Regina Aznar, a research student at the Armagh Observatory, for providing a translation. The structure investigated by de la Reza’s expedition is of the correct dimensions, but they could not explore the complete area of the crater since one cannot see more than a few tens of metres in the now regrown forest. A further, more intensive, aerial search of the region could prove fruitful. The confirmation of this event as a meteorite impact is of paramount importance in helping to establish the rate at which small bodies in the solar system collide with the Earth, and in assessing the amount of environmental damage which is caused by such collisions. Two “Tunguskas” in South America in the 1930’s? Bailey, M.E., D.J. Markham, S. Massai and J.E. Scriven. The 1930 August 13 “Brazilian Tunguska” Event, The Observatory,115, p.250-253, 1995. Daily Herald. Menace of meteors like huge bombs from space. 6 Mar 1931, p.9. De la Reza, J. R. Rumble in the Jungle, Quantum programme of the ABC-TV, Australia, directed by Richard Smith, ABC-TV Science Unit, 1998. De la Reza, J. R. Private communication to J. McFarland, 24 February 2000a. De la Reza, J. R. Private communication to Dr. Serra, 21 March 2000b. Drake, L. A. Private communication to M. E. Bailey, November 1995. Gorelli, R. The Rio Curuçá Event. Meteorite!, August 1995, p.26. Huyghe, P. Incident at Curuçá. The Sciences, p.14-17, March/April 1996. Kulik, L.A. The Brazilian twin of the Tunguska meteorite. Priroda i Ljudi, 13-14, p.6, 1931. Vasilyev, N. and G. Andreev. The Brazilian Twin of the Tunguska Meteorite: Myth or Reality? WGN, The Journal of the International Meteor Organization, 17, No.6, pp.247-248, 1989. Vega, A. J. Posible Evidencia Sismica del Evento “Tunguska” del 13 de Agosto de 1930, Ocurrido en Brasil. Revista Geofisica Instituto Panamericano de Geografia e Historia 44, Enero-Junio, pp. 201-211, 1996.